It’s been said that crowdfunding is less of a straight-forward investment and more like buying wine futures. You’re essentially paying a discounted rate fornext year’s crop. And, just like wine, once you’ve put your money in, you can only hope that the weather is good, the vines aren’t attacked by bugs, and the vintner is as good as he claims. But, this analogy, no matter how clever, falls apart at one crucial stage. With wine, there is already a predetermined market, distribution channels and product awareness. People may not have heard of “Bobby Joe’s Blackberry Pumpkin Chardonnay” but they do know wine exists and they generally know where to find it. This is not the case, though, when it comes to crowdfunded projects. Chevalier’s tale of woe (it gets much worse and involves him moving to another city and working to replay the donations) is the proverbial canary in the coal mine. Simply put: creative types, the sorts of people who can come up with everything from new games to luminescent house plants that can light entire rooms, are generally not good at the nuts and bolts of running the daily operations of a business. Where do people who have gotten their products successfully funded through crowdfunding go to promote and sell their merchandise? Where is the right place to sell their product alongside similar high-quality merchandise? How does someone go about attracting the attention of retail buyers? Using sites like eBay or Craigslist means the seller is, once again, struggling among hundreds, thousands, even hundreds of thousands of competitors for the attention of consumers. Good luck trying to move a dozen units, much less the numbers required to have a viable business. Other options include literally going out and knocking on the doors of every related brick-and-mortar retail outlet within driving distance and hoping they’ll give you some shelf space or fighting with established manufacturers to try and get into national chains like Target, Costco or Wal-Mart. One person who thinks she has the answer is a California housewife and jewelry designer, Candice Georgiadis, who, ironically enough, has just launched her own crowdfunding campaign for startup capital. But, given the name she’s picked for her new business, don’t expect to find her on a popular site like Kickstarter. She’s named it KickStarted —and Candice wants it made clear she is not affiliated in any fashion with that other site with the very similar name—and has designed it to be an online marketplace for successfully crowdfunded projects and the consumers who want the finished products—essentially the next place to go after IndieGoGo, Selfstarter, GoFundMe and the dozens of others online. Its own crowdfunding campaign, which started today, can be found atiKickStarted.com and the cease-and-desist letter from Kickstarter’s team of lawyers can be found in her email inbox. Yes, Candice has been threatened with a lawsuit before either her website or the drive to fund her website has started. KickStarted offers six different methods—Skype, Facebook FB +0.55%, FaceTime, Twitter, SMS text or email/instant message—for buyers and sellers to communicate directly with one another, and vendor accounts range from free to $4.95 and $9.95 per month (no membership is required for shoppers). Sellers can create their own ads and possibly be featured on the homepage’s rotating slideshow, and KickStarted does not charge a commission on sales. 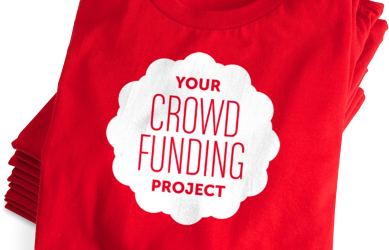 Will KickStarted be the silver bullet to the problems that come with success in the crowdfunding world? Not likely but it might develop into a powerful weapon in the budding entrepreneur’s arsenal.